In the spirit of holiday vacation laziness, today I’m going to share a recipe shortcut I discovered this week, thanks to my friend Natalee. We were talking about how I had a hankering for pulled pork, hence its appearance on my menu. 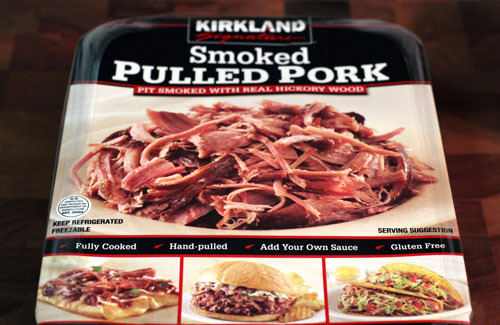 She said, “Have you tried the already cooked pulled pork from Costco that you add your own sauce to?” (She definitely used better grammar than that.) I said, “No.” She said, “You have to!” So I followed directions and picked it up at Costco the very next day. I rarely purchase prepared dinner food. This isn’t even that prepared, mind you. I believe the only ingredients are pork, water, and seasonings. ANYWAY…I cooked it per the package instructions and used the sauce from my favorite BBQ Pulled Pork recipe. Gotta say, Natalee was right. The meat is mighty fine with a just-right-smoky, savory flavor that balances very nicely with my semi-sweet, just-right-spicy sauce. Oh, and it was super tender and juicy and costs about the same as buying the pork uncooked. Quick note on the sauce – I followed the ingredients from this recipe, but sauteed the onions in a large pot until they were soft, then added all the other ingredients and simmered with the meat for about 15 minutes, to let the flavors mingle. Worked like a charm. We’re planning on some fun family time over the next few days, so I’ll see you Sunday with your first menu for 2011! Have a wonderful New Year’s Eve and Day! No food today. My brain is still in vacation mode. And we’re still eating leftovers. But you know I love you and have to give you something, even during these lazy hazy crazy days of, uh, winter. Since 2011 is just a few days away, I thought we could talk calendars. Sound good? Good. I’m pretty picky about my calendar/organizer. I like to be able to see a week at a time but still have enough space to write lots of stuff on each day. And it has to be PAPER. I’ve tried Palm Pilots, iPhones, online calendars, you name it. As techy as my life may be, I rely on good old pen and paper for tracking my day to day calendar. 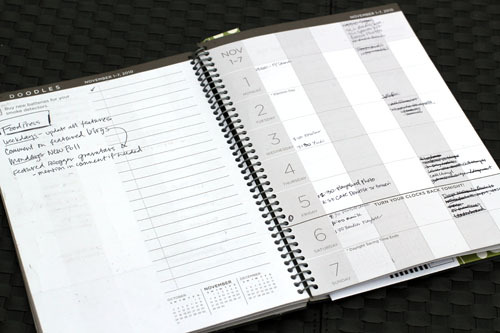 I had a Franklin Covey organizer years ago, but it was really just more than I needed. So, I generally browse the bookstore each December hoping to find something semi-decent. 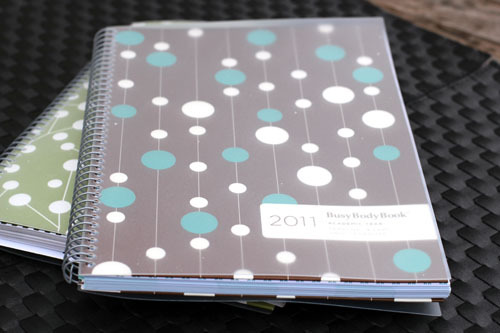 About a year ago, I received a Busy Body Book at a blogging event. Of course I approached it with skepticism, like I do all calendars. But I hadn’t bought a planner yet for 2010, so I figured I’d give it a try. A few weeks ago I realized I was almost out of calendar! ACK! I emailed the owner of the company (wonderful Joan), begged for a few copies (1 for me, 3 for you), and a few days later my beautiful new Busy Body Book showed up on my doorstep. And I’m happy and organized once again! And, yes, I did say I drummed up three copies for you! This post is a giveaway, just like the title says! 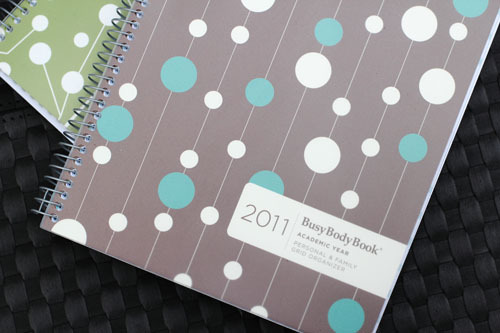 Three of you lucky people will each receive your own Busy Body Book…and you’ll get to choose the cover style! Like all my giveaways, just leave a comment on this post, one per person. You have until Midnight PT on Monday, January 3 to add your comment. Your comment can be anything, but this might be a fun chance to take sides on the paper versus electronic calendar debate. I feel a battle coming on! The randomly-selected winners will be announced on January 4. The girls are still playing non-stop with their new toys, completely uninterested in food. I’m still in vacation mode. Meal planning is about the last thing I feel like doing right now…but we’ve gotta eat! – Don’t forget to top with coleslaw – yum! – New Year’s Eve! 7-Layer Dip, Artichoke Dip, Chicken Tenders, Oriental Chicken Salad are first to come to mind. – Some sort of yummy treat. Maybe as simple as chocolate chip cookies, it’s been a while since I whipped up a batch! I did take these pictures of the homemade marshmallows I made last week, so I figured I’d share them with you. The pictures are just too pretty to let them go to waste. 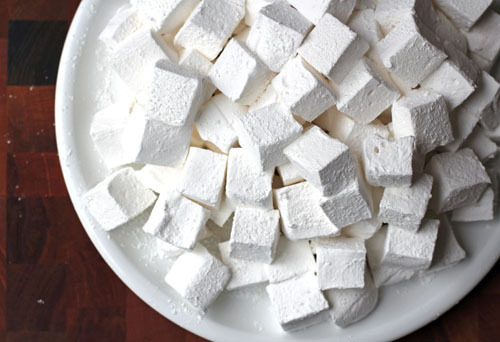 Who knew homemade marshmallows would be so photogenic? If you find yourself bored and needing some accessories for your hot chocolate this week, marshmallows are really, truly easy to make. I wrote about them last year on Make and Takes, and now I’m sharing the recipe again with you. They’re that good. Place the gelatin into the bowl of a stand mixer set up with the whisk attachment along with ½ cup of the water. In a small saucepan combine the remaining ½ cup water, granulated sugar, corn syrup and salt. Place over medium high heat, cover and allow to cook for 3 to 4 minutes. Uncover, clip a candy thermometer onto the side of the pan and continue to cook until the mixture reaches 240 degrees F, approximately 7 to 8 minutes (Jane note: it was longer than 8 minutes when I did it). Once the mixture reaches this temperature, immediately remove from the heat. Turn the mixer on low speed and, while running, slowly pour the sugar syrup down the side of the bowl into the gelatin mixture. (Jane note: as you can see in the picture, I used my ingredient-pourer-shield-bowl-attachment-thingy and it worked perfectly for pouring in the hot sugar.) Once you have added all of the syrup, increase the speed to high. Continue to whip until the mixture becomes very thick and is lukewarm, approximately 12 to 15 minutes. Add the vanilla during the last minute of whipping. While the mixture is whipping prepare the pans as follows. When ready, pour the mixture into the prepared pan, using a lightly oiled spatula for spreading evenly into the pan (Jane note: I also used my not-so-lightly oiled fingers to press the the mixture evenly into the pan). Dust the top with enough of the remaining sugar and cornstarch mixture to lightly cover. Reserve the rest for later. Allow the marshmallows to sit uncovered for at least 4 hours and up to overnight. Turn the marshmallows out onto a cutting board and cut into 1-inch squares using a pizza wheel dusted with the confectioners’ sugar mixture. Once cut, lightly dust all sides of each marshmallow with the remaining mixture (Jane note: this is my favorite part! ), using additional if necessary. Store in an airtight container for up to 3 weeks. 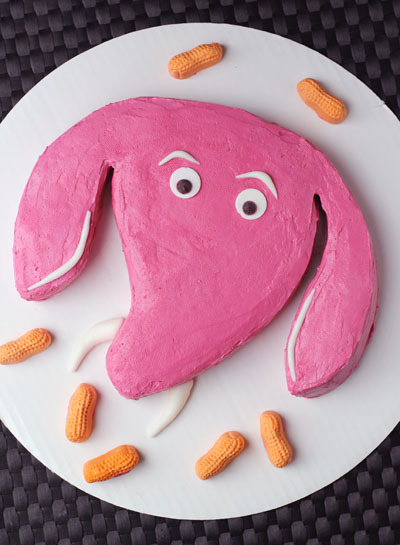 For her birthday, Cate selected the elephant cake from my handy dandy Cakes for Kids book. Honestly, I think the main reason she picked the cake was because it was pink. I was happy to oblige – it was a straightforward design and super cute. 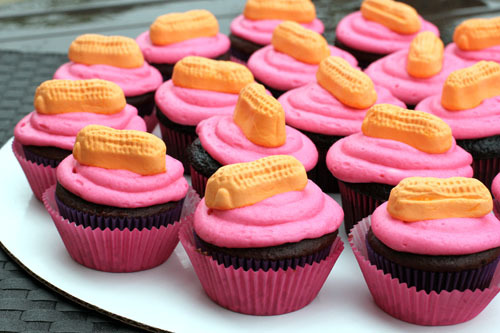 And I could make cupcakes for all the kids, topped with Circus Peanuts to tie it all together (see photo near the end of this post). The cake and the cupcakes were a hit! 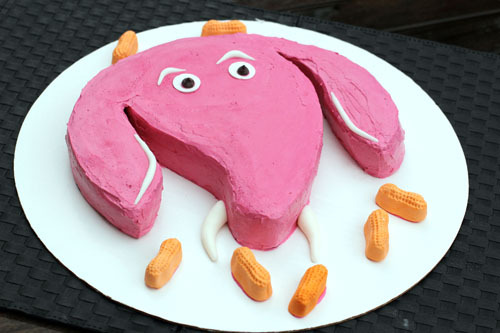 Like I mentioned on Sunday, Cate’s elephant cake tasted light years better than Anna’s ghosty cake. And not just because chocolate cake will kick angel food cake’s patootie any day of the week. But the icing I used for the elephant cake is to die for. The book had suggested frosting the cake with a recipe that uses shortening, because it’s easier to handle and would work for creating texture on the elephant’s skin. But, uh, hello? Shortening? Blech. I promptly picked up the phone and called my good friend Faye, the pastry chef in my life. She suggested I whip up a Swiss Meringue Buttercream, which would also be easy to work with and have the added benefit of actually tasting like food. I’m not exaggerating. Swiss Meringue Buttercream is the creamiest, smoothest, most flavorful frosting I’ve made. I don’t even usually like frosting that much. I love this stuff. 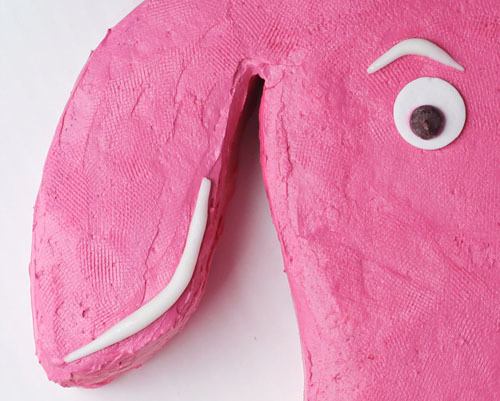 And, sure enough, I was able to gently press a sieve into the surface of the icing to create a super cute texture that every pretty pink elephant aspires to. Combine the egg whites and the sugar in a KitchenAid bowl. Place over a pan of simmering water. Whisk thoroughly until the temperature reaches 165 degrees (which actually happened faster than I was expecting). The mixture will be shiny and the sugar dissolved. Remove from heat, place on mixer. With the whisk attachment, whisk at high speed until it’s a meringue, stiff peaks forming. Stop whisking, let mixture cool until bowl is cool enough to touch and the mixture is room temperature. Whisk at medium high speed, breaking off pieces of butter and adding, mixing after each addition. The mixture will stay quite soupy and you’ll think there’s no way that this is going to turn into frosting”¦and you’ll get ready to grab your phone to call me and find out what you’re doing wrong even though I told you it would work (that’s what I did with Faye)”¦but you just keep whisking and whisking, and then all of the suden it’s right. It suddenly turns into creamy frosting wonderfulness. (I added about 15 ounces of butter total the first time I made it, 12 ounces the second time I made it). At the point that it looks like actual frosting, add your vanilla and any food coloring and whisk again for a few minutes. Leftover frosting can be frozen for future use. Once you’ve refrigerated or frozen the frosting, if you want to mix it in the mixer again you should use the paddle attachment, not the whisk attachment. For the cupcakes, I stuck with my usual buttercream frosting, which is also very tasty and delicious. Use a fork or electric mixer (I use my KitchenAid with the paddle attachment) to cream the butter. Gradually work in the sugar, alternating with the cream and beating well after each addition. Stir in the vanilla. If the frosting is too thick to spread, add a little more cream, a teaspoon at a time. If it is too thin (which is unlikely), refrigerate; it will thicken as butter hardens. 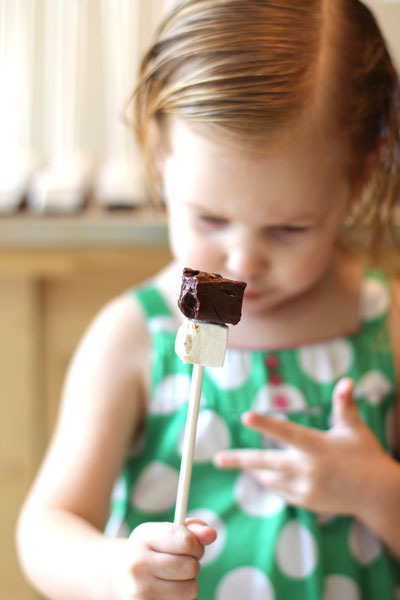 You may have already figured this out…but the ingredients from the picture in last week’s menu post were for homemade marshmallows, hot chocolate on a stick and frosting for my girls’ birthday cakes! Sanjana was the closest guess, “a chocolate marshmallow concoction.” That was almost exactly right! Good job! I have a confession to make. I didn’t make dinner once last week. It’s downright scandalous, I tell ya. In my defense, it was the busiest week of the year for me. I was up until all hours every night trying to get everything done for birthdays, Christmas, work, and oodles of school activities. I was able to stay on top of all of that, but our dinners suffered considerably. Something had to give. And we survived. And the girls were beyond happy with their birthdays, and that’s what matters most! I’m excited to see your menus this week – I love it when there are holidays involved and I get to see your fun traditions and recipes! Oh, and be sure to check back in this week…I can’t wait to share Cate’s birthday cake with you. Anna’s cake may have been cute, but Cate’s was cute and beyond delicious. The frosting, oh, the frosting. It was a new recipe for me and I’m completely in love. You’ll love it too. But I’m not sharing it quite yet. First, you have to share your menu for the week! Happy Halloween! Er, I mean, Birthday! Anna really really really wanted this Halloween cake for her birthday. I figured, you only turn 3 once! And her big birthday meal where she gets to eat anything she wants? Hot dogs! I do believe that might be the perfect third birthday. The more I stare at these ghosts the more they look like thug snowmen with sunglasses. Perhaps Anna was going for a winter theme after all. Or maybe she’s rebelling against having a birthday so close to Christmas. Whatever it is, I love it. This was my first foray into the world of Seven-Minute Frosting, which is essentially meringue that tastes just okay but looks really cute. There is some technique involved with preparing it, but it’s not too hard. And the frosting is actually quite forgiving. If you mess up, just scoop it off the cake, smooth everything out and start again. I made a LOT of awful looking ghosts before reaching the final product! I got the idea for this cake from Cakes for Kids by Matthew Mead. LOVE THIS BOOK. 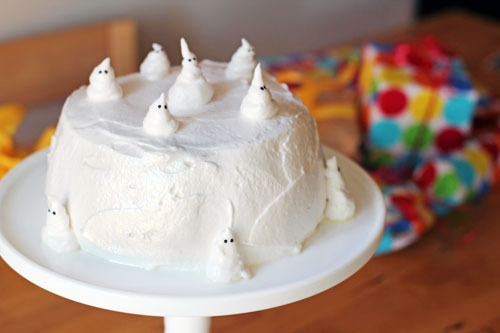 This ghosty cake is an angel food cake with frosting filled in the hole. I doubled the frosting recipe below so I was sure to have enough, but make sure you use a large bowl because it made a LOT of fluffy frosting. I used a big ziploc bag with a smallish hole cut in the corner to pipe the ghosts. Mix sugar, water, egg whites and cream of tartar/corn syrup in the top of a double boiler or a heat proof bowl that can be set over a simmering pot of water. Using an hand mixer on low speed, beat for 30 seconds. Boil some water in the bottom of a double boiler or in a pot. Place the top of the double boiler or bowl on top. Cook over medium heat, constantly beating with the hand mixer on high speed until stiff peaks form (probably 7-10 minutes for a single batch). Remove from heat, fold in vanilla then beat again for 2 minutes. Let frosting cool to warm or room temperature before working with it. Discard leftover frosting. The frosting is perishable, so make it the day you plan to serve it and refrigerate any leftovers. I am giddy with excitement over my guest post at Make and Takes today. Hot Chocolate on a Stick is my new favorite thing. 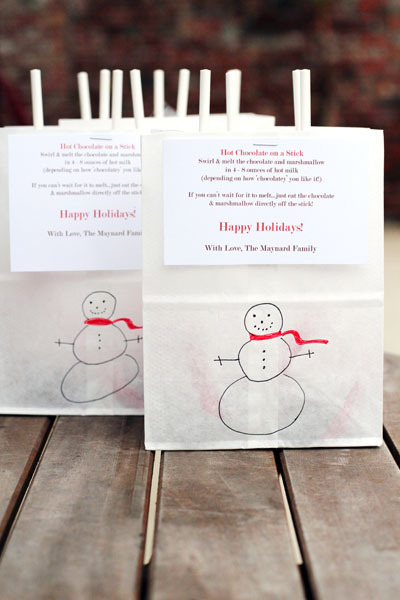 Beyond delicious and completely adorable, I can’t wait to pass them out to all of our friends! 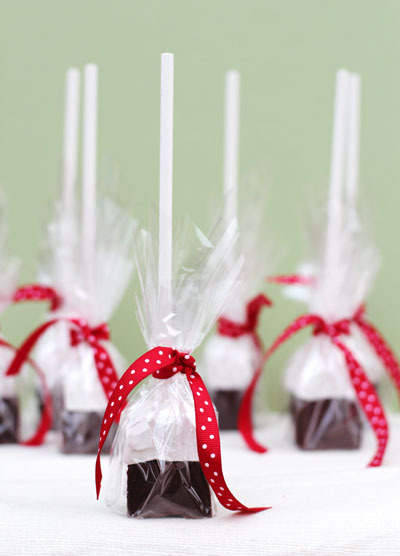 Why is it that when you put something on a stick, it automatically becomes cute? Well, besides corn dogs, but you know what I mean. 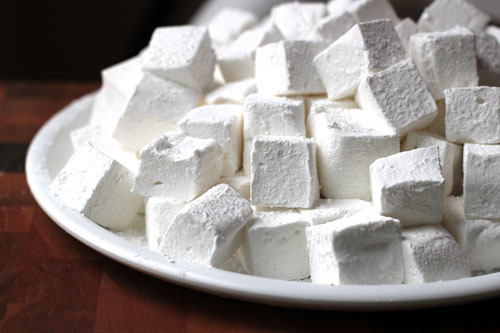 I have platefuls of homemade marshmallows lying about, tempting my girls at every turn. Yesterday morning Anna called from the kitchen, “Can I have a marshmallow?” I decided to let her indulge, it is Christmastime after all. So I called out, “Yes!” A few minutes later I went into the kitchen and this is how I found her. I thought she just wanted a marshmallow. She meant the entire hot chocolate stick! And then, THEN she didn’t even eat it all! I couldn’t let that chocolate go to waste, so I had to eat the rest for her. Ah, the sacrifices of motherhood. Now, get on over to Make and Takes. Yes, I’m being bossy. But I told you, I’m excited! Chop, chop! Not only had I never made chicken and dumplings before last week, I’m not entirely certain I had ever even eaten them before, either! (I have a feeling my Southern sister-in-law’s jaw is firmly fixed on the floor right now.) 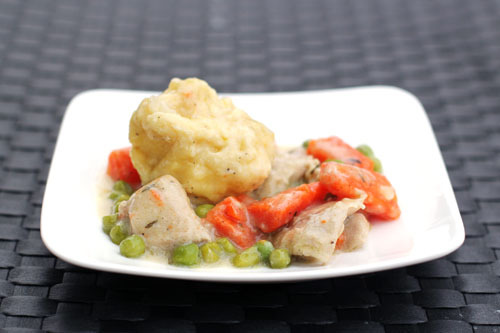 I kept seeing ‘chicken and dumplings’ pop up on your weekly menus, and, a few months ago, my grandmother gave me a recipe for dumplings that she simply gushed over. I figured the fates were urging me to try my hand at this dish. Every person in our little family gobbled up their dinner, which is the true measure of success in my book! 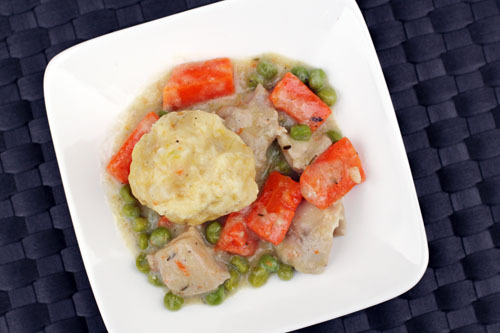 The chicken was flavorful, tender and moist, and the sauce reminded me of a delicious pot pie. And the dumplings were definitely yummy and provided a great texture and flavor balance. Thanks for the recipe, Grandma! We’ll definitely be making this for dinner again sometime. In a dutch oven or heavy 5-quart pot with a tight-fitting lid, melt 3 tablespoons butter over medium heat. Add onion, carrots and thyme. Cover; cook, stirring occasionally, until onion softens, about 5 minutes. Add ¼ cup flour; cook, stirring, 30 seconds. Add chicken broth and bring to a boil, sitrring constantly; season with salt and pepper to taste. Add chicken to pot, reduce heat to medium-low. Cover; cook, stirring occasionally, 20 minutes. While the chicken is cooking, melt 4 tablespoons butter in a heavy skillet. Add milk and bring to a boil. Add ½ cup flour and ½ tsp salt, whisk well. (The mixture will be pasty and sort of difficult to whisk, just mix it the best you can so the butter and flour are incorporated.) Remove from heat and let sit for 2 minutes. Add 2 eggs, 1 at a time – beat fast and hard. Once chicken has been cooking for 20 minutes, stir in peas. Raise heat to return to a simmer, then drop dumpling batter into the soup by tablespoonfuls, evenly spaced throughout the pan. (They grow while they cook, so be sure to space them out.) Reduce heat so soup maintains a simmer, cover and simmer for additional 20 minutes, until chicken is tender and dumplings are firm. During this final simmer, the soup and chicken tended to stick to the bottom of the pan, so I would just gently stir occasionally with a small spatula so as not to disturb the dumplings too much, which worked just fine. ‘Books I’m Reading’ with Martha Stewart: The Next Book! Martha is keeping me on my toes. We’re already on to the next book for her Books I’m Reading book club! 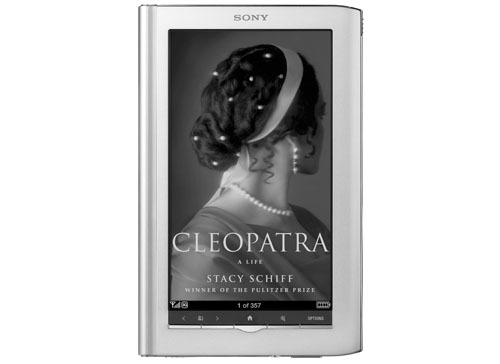 This month’s book is Cleoptra: A Life, written by Pulitzer Prize-winning biographer Stacy Schiff. Confession: I’m a fiction person all the way. Two non-fiction books in a row is, well, not what I would choose. BUT…all this learning and stuff is good for me, right? 😉 And, after doing a little research on the book and starting it this past weekend, I’m actually pretty excited about Cleoptra: A Life. I know very little about Cleopatra and what little I do know is ill-informed, I’m sure. Can’t wait to read an accurate history of her life and, I’ll be honest, get all the dirty details on the murders, affairs and intrigue! ;)Check back in a month or so for my “book report”. Should be a good one!